Hakata ramen. with its roots deeply implanted in the Kyushu island ramen culture of Japan, is responsible for the establishment of the milky white and creamy tonkotsu (pork bone) soup as one of the most popular ramen broths, rivaling the stalwarts of shoyu (soy sauce), shio (salt), and miso. It has also had an impact in creating hybrid soups, such as the well liked tonkotsu-shoyu, that you find most often in the Kanto (e.g Tokyo) region. My first exposure to tonkotsu ramen was in the spring of 1997. I was in Fukuoka (capital city of Kyushu island) and was taken to the eye-opening outdoor ramen stall alley found in the district of Nagahama. It is a well known tourist site, bringing in ramen fanatics from across the country, and is located on a side street near a major wholesale food market. It operates at night, and when it becomes dark, the lights from inside the various tents and stalls on this road come on and attracts diners like moths to a flame. There are also more proper in-building ramen shops operating in the area, but for me, the lasting impression of the street stalls remains with me to this day. So I was strongly looking forward to the opening of Menya Japanese Noodle on West Broadway, near the Cambie Street intersection (the one with the dreaded, ongoing Canada Line construction), after hearing rumors that tonkotsu was their soup of choice. With the growing base of places to eat ramen building in the downtown west end, it was refreshing to see another option that was not located in the city core. Opening its doors on September 8th, I planned to wait at least a month to allow them to settle down, but a recent rainy day made me long for a nice hot bowl of tonkotsu ramen, so I broke with my intended plan. Despite the dreary weather, the room was full as I stepped inside during the lunch hour. No doubt, word had spread already about this place, and many other curious people had joined me in trying it out. Couples, families with children, people of all ages and ethnicities were here, providing evidence that ramen has become more widely accepted in the city as another definitive dish from Japanese food culture. An inquiry to a member of the all-female serving staff led to a good piece of information as I sat down with the menu – the owner/head cook had actually worked and trained in a Fukuoka city ramen shop (name withheld). The top of the menu board featured a Nagahama Ramen ($6.75); in Kyushu, Hakata-style and Nagahama-style ramen are basically inter-changeable in terms of vocabulary, as both are tonkotsu-based. Next to it was a Tonkotsu Miso Ramen ($7), as well as a Ramen Set ($10) that would give you a bowl of ramen, one onigiri (rice ball), and gyoza (I think four pieces). Rather than fill up on these extras, I decided instead to add some more toppings in the form a nitama (flavored boiled egg; $0.75) and chashu (slices of pork belly; $3, which came with some marinated bean sprouts). I split these added toppings with my dining companion, who also ordered the Nagahama Ramen. The tonkotsu broth was what I’d classify as mid-level in terms of heaviness. I detected some slight pork fat added to the mixture, giving it a slightly more oily consistency than what you’d typically find in Hakata-style ramen (you see this more often in Tokyo-style). It was very creamy and a respectable representation of a solid tonkotsu broth, and to top it off, there was none of that distinctive pork scent that you can find at times in tonkotsu soups. The Nagahama Ramen did come with the usual toppings of beni shoga (thin slices of ginger that is pickled) and konbu (kelp), along with chopped green onions and bamboo shoots. The beni shoga is a key one here for tonkotsu-based ramen, as its used as a refreshing element and to help mask any notable pork scent coming from the soup stock. Lastly, I did notice another element that is found in this style of ramen in Japan was missing, a spoonful or two of some garlic-infused flavored oil. Kyushu region ramen commonly uses a thin straight variety of noodle. This holds true at Menya. In ramen joints in Japan, it is often possible to order oomori (e.g. a large serving of noodles). But here in lies the problem with an bigger volume of noodles in a bowl of hot soup. The thinner the variety, the less its able to hold up over time. Even a few extra minutes of sitting in the hot soup can be detrimental, and cause the noodles to completely lose all of their texture, become overcooked and turn into limp strings. To get around this, ramen shops in Kyushu came up with the concept of kaedama (literally translated as “replacement ball”). At Menya, they have also implemented this into their menu. Basically, once you have consumed all of the noodles, you can order a followup serving of only-noodles, to add to the soup that you still have remaining (provided you are not one of of those overzealous types who drink down all of the soup as you go). I appreciate all that Menya has done in their early days, bringing to Vancouver a pure representation of Hakata-style, tonkotsu ramen, as well as including the little nuances of ramen culture into their menu setup. By focusing on this soup broth, and this alone, I think it can carve out its own niche. Geographic distance from the Kintaro kingpin in this market will also no doubt help. Judging from the packed house, it seems there are plenty of ramen fans who will come to this non-downtown location. But ramen is such a personal preference. Myself, I do enjoy tonkotsu, as well as shio soups. I tend to prefer a more crinkly noodle, and probably consume more lighter broths than denser ones. At times, I enjoy a fuller bowl with lots of additional toppings, which often goes better with miso broths. If it is a complete mishmash for me, I am guessing I am not alone in enjoying variety in my ramen. But Menya deserves consideration for your tonkotsu option in your Vancouver ramen preference set. 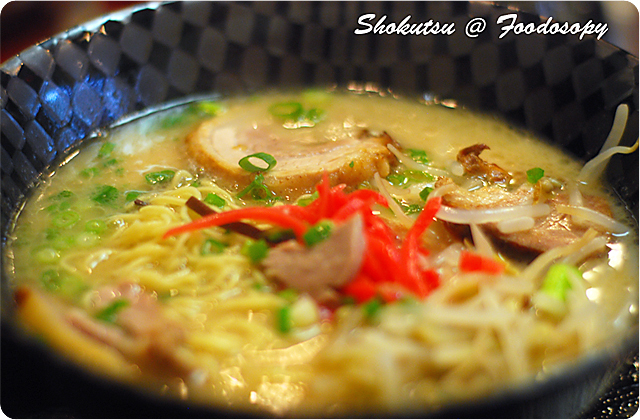 This entry was posted in British Columbia, Canada, Vancouver and tagged casual, japanese, noodles, ramen, tonkotsu. Bookmark the permalink. Nicely done, a great read. Just to be clear, you can order another batch of noodles as long as you have enough broth left over. This is free? They had this at ippudo. The second serving of noodles does incur a charge. At Menya, I did not note how much this was, but would imagine it wouldn’t be much (guessing under 3 dollars?). Very pleased to receive comments such as yours, it is indeed our hope to not only simply comment on our dining experiences and describe the dishes, but also to provide some informative details about the culture, cuisine, etc. that perhaps readers do not get from other similar review sites out there in the blogosphere. Both myself and my writing colleague, the Foodosopher, do enjoy sampling the many Japanese offerings out there around the world, so please do stop by from time to time, as I am sure you will discover we have eaten in many, and hopefully some of them are still new to you as well. Great in depth review. I haven’t tried this yet…look forward to trying this soon. The Ramen set looks interesting…I normally like ordering a side of Gyoza with my Ramen. Thanks for dropping by, please do share your thoughts when you get a chance to visit this place. I agree with you that a side of gyoza is a welcome pairing with a good bowl of ramen. I tried it recently…will be posting my review soon shokutsu. Let me just say that I really liked the Gyoza at Menya. I didn’t like their choice of noodles…I prefer the ones at Kintaro/Benkei/Motomachi. Sounds good, look forward to hearing your thoughts. I didn’t have the gyoza, but did see it at a nearby table, so can’t comment on it much. Noodles are such a personal preference, but the straight variety they use at Menya is the correct fit for true Hakata-style ramen. shokutsu, I recommend that you try the Gyoza out. I really like the presentation of the Gyoza too. I have a pic of it which I’ll upload to my blog when I review it. Indeed that was a unique way, though I imagine it has more to do with the size and shape of the pan they are using. In Japan, in ramen-ya, you’ll find they have these gyoza-specific cooking units that are long and rectangular in shape, and with a dash of water mixed with cornstarch, upon completion they are all connected together in one long brick shaped form. That’s very interesting. Thanks for the information. I tried the rice cake too…I didn’t think really like it. Maybe I’m just not a rice cake fan. In the future I’m just going to order the ramen and gyozas. Hey did you hear that Kintaro is celebrating their 10th anniversary on Monday, January 26th? The first 500 bowls of miso ramen and gyoza can be had for the measly sum of $2 each.